Which players shone brightest and who had games to forget from the Scottish football weekend? The drop off in standard of last season’s Players’ Player of the Year winners, both north and south of the border, has been remarkable. At Chelsea, Eden Hazard looked primed to make the next leap up, going from the class of player underneath the world’s undoubted best (Messi, Ronaldo, Suarez) to joining such an elite list. This year’s he’s looked no better than Erik Lamela. While in Scotland, Stefan Johansen was the stand-out candidate to be the next profit-making development star after Virgil van Dijk’s inevitable departure. Instead, he lost his preferred place in the side, at the attacking midfielder role, to a young Australian who didn’t play a minute of football for Celtic last season. Other factors have contributed to his troubles. Scott Brown’s injury troubles have forced Ronny Deila to use Johansen further back at defensive midfield. The Norwegian can operate there but he’s nowhere near his effective as he is further forward, but when he played at the No.10 spot earlier in the season, his form was poor due to a back injury. Fans like to dismiss injuries, insisting that players should carry on through them unless their leg is hanging off because they earn thousands of pounds per week - next time I get a knock playing fives, I’ll need to try rubbing a £20 note on it to make it feel better – but back injuries can be really troubling as they can affect how every part of a player moves. Johansen has been injury-free for a couple of months now and looks like getting back to his previous best. He was finally allowed to return to his old role behind striker Leigh Griffiths and was one of Celtic’s better players, if not their best player, in the routine 2-0 win over Ross County. However, Tom Rogic has also just returned from injury, and with Brown also back it’ll be interesting to see how Deila utilises all the players available in a suddenly crowded midfield for Celtic. At the beginning of the campaign you could have got odds of 80/1 on Kane Hemmings finishing top goalscorer in the Ladbrokes Premiership. Granted he won’t actually do it thanks to Mr Griffiths, but I still thought it worth mentioning to put his terrific season into context. He made it 18 for the campaign, and an astounding 12 in his last nine games, with a double against St Johnstone on Friday. If there’s a better example of a promising young player wasted at Ibrox under the Ally McCoist era, then I’d like to see it. Despite his club playing in the fourth tier, Hemmings rarely got a chance. When he did get a rare start, he looked utterly lost in McCoist’s system. I recall one end-of-season game against Stirling Albion where he was stationed up front on his own while his barely interested team-mates launched high balls in his general direction. Having spent part of that season on loan at Cowdenbeath, he then returned to Central Park on a permanent basis the following year and duly finished the campaign as the second tier’s top goalscorer. This was despite him playing on an utterly mediocre side that only survived thanks to him and strike-partner Greg Stewart. Who’d have thought it? Lee McCulloch, otherwise known as ‘Jig’ to his friends – or ‘Elbows’ to fans of most other sides – seems to be a pretty clued-up manager and one that will take over a club at some point in the near future, unless he wishes to wait around for the end of Lee Clark’s tenure. Against Motherwell, Killie were everything they hadn’t been for numerous matches in the Gary Locke era: disciplined and organised. They restricted what the hosts could do in the first half before building their confidence and blowing away Motherwell in the second. 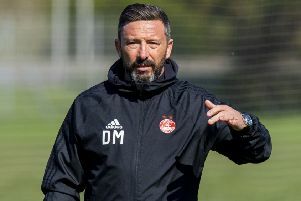 It wasn’t enough to get him the job – having been at his press conference after the Rangers game, I’m not sure he wants the responsibility so soon into his coaching career – but it will look great on his CV when a job he really wants becomes available. He’s not a winner for his performance at the weekend. McKay was strangely subdued in Rangers’ 1-1 draw with Alloa, though that may be down to the fact the Indodrill pitch was narrower than my hall. Rather, his inclusion is because of the new deal he’s been awarded, keeping him at Ibrox until 2018. A good friend of mine (who I have to admit to stealing the hall joke from above) is a Raith Rovers season ticket holder, and he really disliked Barrie McKay. Every synonym you can think of the word “useless”, he applied to McKay at some point or another last season. Morton fans had pretty much the same opinion of his abilities the season before. It shows that the youth system, while generally a good tool to judge whether a prospect has what it takes, doesn’t fit everyone. Because McKay has been absolutely outstanding this campaign. The Alloa game stood out because it was one of the few times I’ve seen McKay when he didn’t impose himself on the match. Wingers, as everyone knows, are naturally inconsistent. A large part of this is down to their position on the field. Playing on the periphery, they often require the work of others to get them involved in the game. McKay almost never seems to have this problem. He’s always at the heart of the action, and his desire to relentless run at opponents and ability to cross into the penalty area with both feet, make him a complete nightmare for defenders. There are a lot of Scottish football fans out there who think that Taylor is a complete huddy. He’s not, but it’s easy to see why. Aberdeen fans rightly defend the player because, 90 per cent of the time, he’s solid as a rock, not to mention athletic, dominant in the air and generally a big reason why the Dons are up near the top in the first place. But when he has a poor game, oh boy does he have a stinker. His Bambi-on-ice impression that allowed Iain Vigurs to fire Inverness level last night killed all of Aberdeen’s momentum. And while the penalty awarded against him didn’t look like a foul, the challenge itself was still a bit of a rash one to make in his own penalty area. He then supplied the glancing header which helped Carl Tremarco make it 3-1. My gut instinct is telling me to now go on a rant about Aberdeen now have no chance of winning the title because of such defeats and so on, but I’ve counted them out so many times before and yet Celtic keep letting them back in. So, I predict there is still another sting in this tale to come. Celtic will still be champions, though. If you want to make fun of Aberdeen and say that they bottled it – which they did – you have to apply the same tag to Hibs after failing to cut the gap on Rangers with a disappointing draw at Livingston. Let’s face it, there aren’t going to be many other opportunities for the Easter Road club to take advantage of Rangers dropping points this season. Mark Warburton’s side have struggled in front of goal in the last four matches, scoring only three times, but this has been partly down to a drought from Martyn Waghorn, who’s been uncharacteristically wasteful. Once he gets going again, with an improved steeliness in defence, it’s only going to be a matter of time before they start thumping some of the Ladbrokes Championship also-rans. With Hibs able to cut the gap down to five points with their game in hand, and still 12 fixtures remaining, there’s no way we can count out the nearest challengers yet. However, the problem is that both sides win matches with tremendous regularity. Hibs are on pace to earn 81 points this season, which is usually more than enough to lift the second tier crown. Unfortunately, Rangers are on pace for 90 and Alan Stubbs may need to pray for another Ibrox slump, like the one they suffered in November and December, if he’s going to come out on top against Mark Warburton. Every time Collum makes a horrendous blunder, people always come out and say: “aye, and he’s our best referee as well.” This annoys me for two reasons. 1) It’s part of the whole ‘let’s put Scottish football down at every opportunity’ narrative that exists in this country. And 2) it’s not even true. I don’t care what the SFA says or what Uefa says, those institutes have a long and rich history about getting things wrong, and that’s also the case with Collum. He’s not Scotland’s best referee. He’s not even in the top three. Bobby Madden, Craig Thomson and Steven MacLean are all better. Collum is too quick to dish out cards, gives penalties as if it satisfies some sort of perverse fetish and refuses to talk to players or managers during the match. I’d even have a member of the middling pack, the likes of John Beaton and Crawford Allan, than I would Collum. Not Andrew Dallas, though. I wouldn’t go that far. How’s this for a possible scenario? Motherwell go on a Hibs-under-Terry-Butcher style run of defeats and fall below Dundee United in the table, suffering relegation. While still being unlikely, it certainly could happen and there are parallels. McGhee’s the kind of hard-nosed man who could rub players up the wrong way. It’s an ageing side so there are a few players who McGhee may have earmarked for a summer exit, and like Butcher he might make a terrible error by telling them too soon. The club seem stuck in a bit of a malaise, and they are already fully rooted in a rut, having failed to win any of their last six.